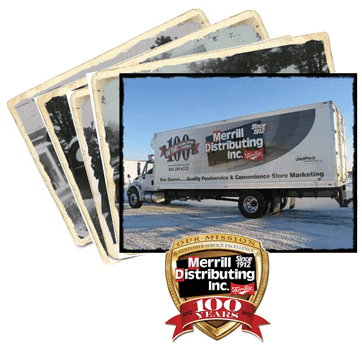 Merrill Distributing, family owned for three generations, is celebrating a milestone anniversary in 2012: 100 years in business! 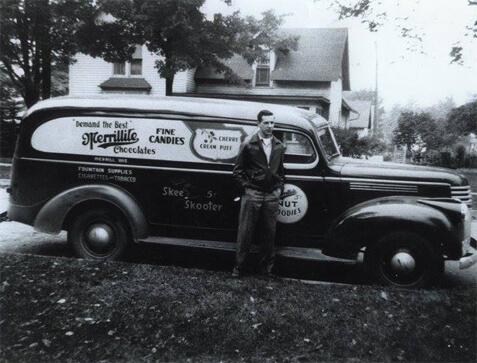 The Merrill Candy Company, as it was then called, was incorporated in August, 1912 in Merrill, Wisconsin as a candy manufacturing business owned by Adam P. Schewe and presently owned by his son and grandson, Ralph and John Schewe. 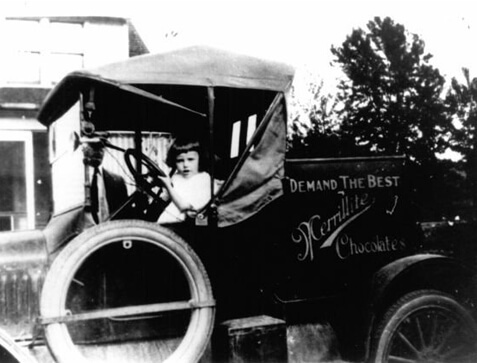 Based on high product quality and high grade fancy packaging, their chocolate bars and bulk candy became known locally and throughout the Midwest, utilizing nationwide distribution, using the registered brand name “Merrillite”. Over the next 25 years, rapid expansion required a larger location in Merrill, an aggressive sales organization, secure national distributors and brokers as well as the employment of 70 individuals. The company also began a wholesale division; distributing cigars and candies manufactured by other companies, such as Swisher, Hershey and Mars, along with paper, chemical cleaning, and janitorial supplies. As the years progressed, the company expanded its wholesale operation by including cigarettes, tobacco and allied products, distributed to many Wisconsin communities. In 1964, candy manufacturing was disbanded due to the high freight rates of inbound raw materials and finished goods outbound from Merrill, Wisconsin. At that time, more products were added to the wholesale distributing system servicing the Central and Northern Wisconsin footprint. In 1974, construction was completed on a one-story, 30,000-square-foot warehouse, equipped with modern material handling equipment. Over the next 14 years business evolution then encouraged the company to install state-of-the-art IBM computers, communication systems, and to add retail groceries to the distribution system. In 1988, Merrill joined UniPro Foodservice (then Code, Inc.) for buying power and to better reflect the company’s expanding product line for the restaurant industry through multi-temperature delivery systems. The company name was changed to Merrill Distributing, Inc. in 1990. This initiative was taken to represent the new image and business model of offering two service industries; convenience stores and restaurants. In 1995 sales growth was a major initiative to compete, hence, a 20,000 square foot addition with 30-foot ceilings was added, containing 600,000 cubic feet of multi-temperature storage, and all distribution processes were enhanced through new technology. This allowed the company to have excess reserve capacity, up to $60 million in sales, with subzero and refrigeration expansion already built within the current footprint of the building adding very little expense to increase capacity. Hot and cold beverage dispensing equipment and repair services were added to support both convenience stores and restaurants. This brought the total facility to 50,000 square feet to provide more efficient and quality services to its customers with more than 10,000 national branded products including dairy items, fresh meats, seafood, fresh produce, frozen foods, hot and cold beverages, bakery, paper and janitorial products, dish machine and laundry equipment programs, and convenience store retail items. All sales and service processes are totally integrated through technology and the Internet. Today, the family company has two sales and marketing divisions being; Foodservice/Restaurants and Convenience Stores servicing more than 1,500 customers in Wisconsin through district sales consultants while providing deliveries within 24 hours to 90% of the market area, sold by area district sales consultants. Customized education through North Central Technical College, along with the dedication and passion of each department Team Leader and their staff, has allowed the company to evolve as it has, by listening and learning from each customer’s needs, as well as provide the company’s mission of “Customer Service Excellence” through Servant Leadership principles and strong family values.